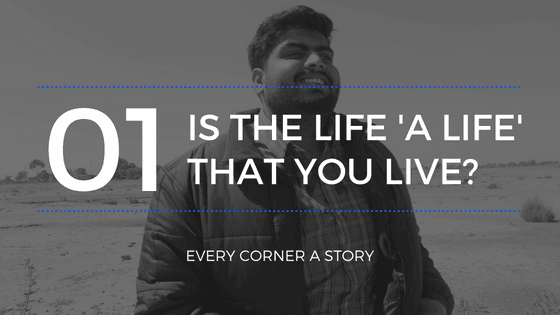 Home Agenda Blogger Business CEO CTO ECAS India Every Corner A Story Founder Inspirational Life Motivational Puneet Bawa Quotes Struggle Success Victory ECAS Life : IS THE LIFE A LIFE THAT YOU LIVE? ECAS Life : IS THE LIFE A LIFE THAT YOU LIVE? The Life hmm, What life is? Where life is? What's life all about? What life is this? What life means to me? What life means to you? to others ? to anyone? How is your life? What are you doing in your life? Where the hell have you been in your life? Is life all about lifestyle? and many more of them. These are the questions which we tackle daily in our life Is that our life? See every time when we, our friends, our dear ones or anyone talking of your life, his/her life or someone else's life, there is a question mark in our life, his/her life or anyone's life. Is it? Is the life all about question marks that keep striking you whenever you discuss your living. There is much different meaning to the life. Anyway, you think it gives a new meaning to life. Isn't it? Everyone has a different meaning to life. Is that what you hear from others? Everyone in the world has the same thought " It's my life I am gonna deal with it". Then again the question arises Really, is it? When we think about our daily lives we may begin to think about what is familiar to us. We do not think about the love in heaven or the fire in hell. We think of the routine – of waking up in the morning, wiping the sleep from our eyes, standing in the shower letting the water run over us. We eat breakfast and life only begins to come alive. That's what life about? Is one life not enough? The purpose of our life should be life itself. "Man is not born to solve the problems of the universe, but to find out what he has to do.. within the limits of his comprehension." --Johann Wolfgang von Goethe. The purpose of life is to live it to taste experience for the utmost to reach out eagerly and without fear for newer and richer experiences. The life is a precious asset and without knowing the purpose of life, life becomes aimless without the final goals. "Struggle with a purpose is more meaningful than success without a purpose". Give it a shot! At the very least, you’ll learn one of two things: your true purpose in life -or- that you should unsubscribe from this blog.